Yesterday I played in the pond just like I did when I was little. Before work I took my fishing pole, a net and a bucket out back, feeling like revisiting a childhood activity I used to enjoy so much. I loved played in the water growing up, fishing, swimming, hunting for critters. You name it, I caught it. I wasn’t ever squeamish or afraid, and I never hurt them. I was instead curious about everything, eager to touch, to see, to learn. 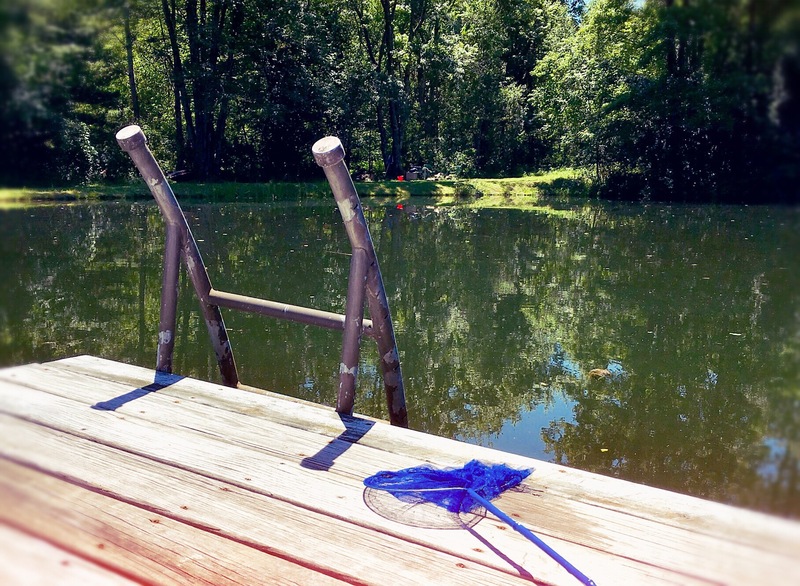 Feeling like that curious girl again, I scooped up small fish near the dock, chased bass and bluegills around with my pole, went on safari searching for frogs and turtles hidden in the reeds. I didn’t have long to linger, but it was fun to spend an hour goofing around in the sun, dangling my feet in the cool water watching bluegills marvel at the sight. It’s always a good idea, I think, to play again, especially as an adult when life gets so serious sometimes. You don’t always have to have kids to feel like a kid, to stay young at heart. It just seems to be a matter of letting go of grown-up thinking for awhile, and remembering when the world was a magical place filled with undiscovered adventures. I plan to have more of them this summer, as many as I can.